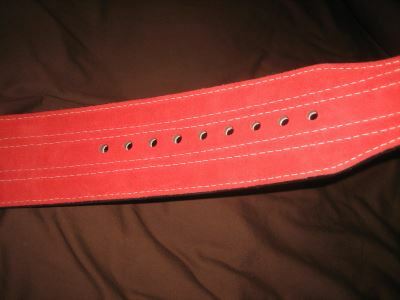 The Ader belt is 4 inches in height and is 3/8 inches in thickness. 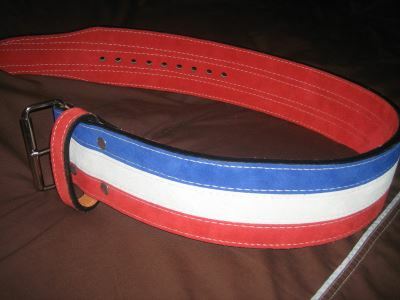 It is available in alternate colours such as red, blue and there is also a striped version in red, white and blue. It comes with a double pronged buckle and at closer inspection appears to be constructed from 3 layers of leather bonded together. It also has a soft suede lining to provide that little extra comfort. First impressions of the belt are that it feels durable and sturdy for the price and so it would take a good few years of moderate to heavy abuse at the gym. The quality of the leather is good. It is double stitched but when looking over the belt with a keen eye, the stitching itself can leave a little to be desired in some places. After our first few sessions, we noticed some slight fraying on the edges on the leather and at the end of the belt. So this should be expected. Also, the roll sleeve on the buckle looks to be made from a thinner and cheaper metal compared to the rest of the buckle which itself looks to be of a strong high quality. The sizing for this belt is a little off. It is recommended that a size down from normal is ordered as people often find that it is loose even on the lowest hole when they order their usual size. The hole spacing is logical and looks like it will allow for growth or weight loss quite nicely. We found that when wearing our belt, the loop seemed a little too close to the buckle meaning that when new, it is difficult to bend inside the loop and also when the belt is fitted at it tightest setting, there is a large amount of it flapping about. But this was just a minor issue. The double pronged buckle provided great additional support when lifting but makes putting on and removing the belt sometimes a little more difficult. But the more you use it, the easier it will be to get on and off. Plus you can just use one prong instead if it gets annoying. The support provided by the belt is excellent and is much better than some cheaper belts. It certainly provides something substantial to push against and does not feel insecure at all. It certainly provided enough support when squating 400lb+. But at first this is a stiff belt until worn in and we found that it occasionally pinched our skin on the first few uses. Also, is not the type of belt for circuit training or dynamic Olympic lifting due to it’s stiffness and thickness. So if that is your kind of exercise, we certainly recommend and softer and thinner belt. 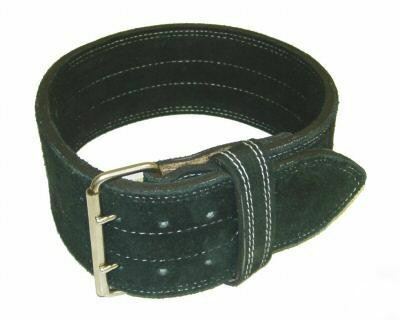 This is a reasonable mid-range belt. It is not of the 13mm powerlifting variety and so not really suitable for those big lifting competitions. But it is better than a flared style bodybuilder belt and is very good for casual lifting. This is a great semi-pro belt and sits somewhere between the budget belts the top-end professional belts and so we recommend it for this.